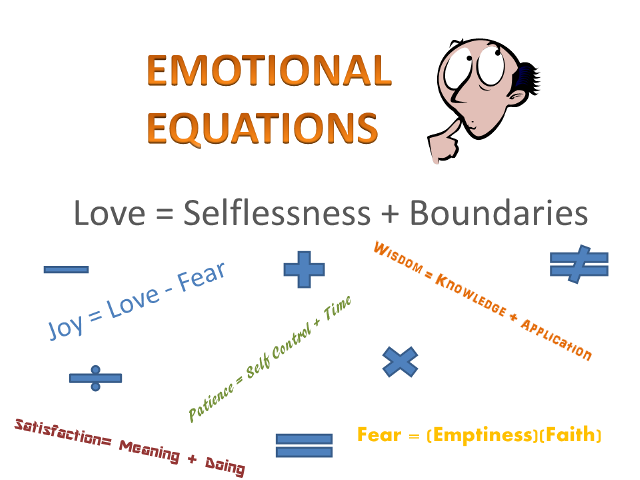 Emotional equations, a concept developed by Chip Conley, breaks down typical emotions into components much like a math equation. By learning emotional equations one can think about the ingredients fueling the emotion and make behavioral changes to change the emotion constructively. 1.3.3 Analyze personal and family assets and skills that provide service to the community. 3.3 Analyze assumptions that underlie beliefs and actions. Emotional equations break down typical emotions into components much like a math equation. By learning emotional equations one can think about the ingredients fueling the emotion and make behavioral changes to change the emotion constructively. Directions: Create the emotional equations for the words given and come up with the emotion for the equation for questions 8-10. Using small white boards or pieces of paper have a class discussion on each of the equations. Have each group write their equation for each emotion and hold them up. Make tallies on the board for similar answers. Have groups that have different components explain their reasoning and/or give a situation that illustrates the component. For example, Love= Selflessness + Boundaries. I chose boundaries as a component because true love sets limits and does not just let someone take advantage or enable bad behavior. Emotional equations help us to think about emotions and how we can use them to respond instead of react to life. If you have time have your students write a 1 paragraph journal entry describing how they might take these emotional equations and apply it to life.